Boogie Stomp! – NYC | Boogie Stomp! | The Musical | Boogie Stomp! Boogie Stomp! 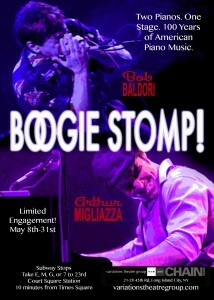 the Stage Play is an evening in the theater with two of the greatest jazz/boogie/stride/blues pianists in the world. 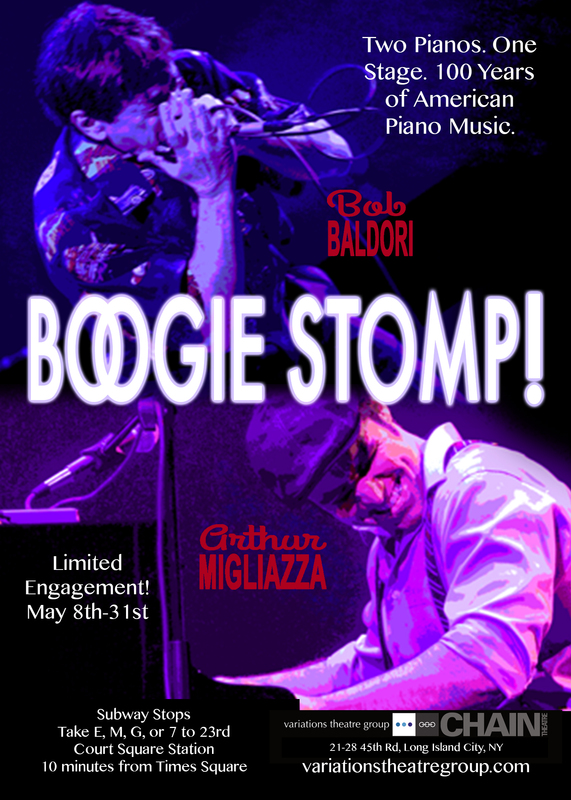 Together, they tell the story of boogie woogie, its origins, subsequent history and ongoing development, and how it relates to all of American music.Boogie Stomp! is the story of relationships. The basic elements of the original American music that came to be called blues, jazz, swing, stride, boogie, rhythm and blues and eventually rock and roll are rhythm, improvisation and syncopation. How these elements are related to the various names given to the music over the last hundred years is talked about, explained, and demonstrated in a thoroughly entertaining and “move you out of your seat” manner. VIP TICKETS INCLUDE A SPECIAL RECEPTION WITH THE PERFORMERS AFTER THE PERFORMANCE. DRINKS AND LIGHT SNACKS INCLUDED.GALA PERFORMANCES INCLUDE CATERED BUFFET MEALS, AS WELL AS DRINKS FOR THESE VERY SPECIAL PERFORMANCES.